Clive Sound now offers lost cost AV solutions for small to medium conference events. The business sector can now benefit from the same carefully sourced products to deliver really professional results at a fraction of the cost normally found in the AV sector. 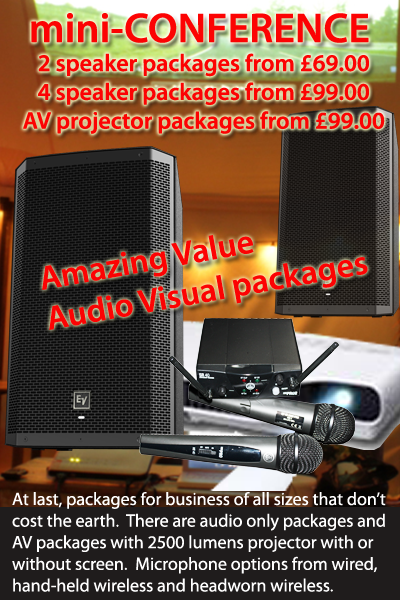 An audio visual package that any business can afford. 2 EV ZLX12 speakers, a Casio XJ-A140 2500 lumens laser/LED slimline projector, AKG twin hand-held radio microphone system, a micro mixer with stereo input and mic input and the ultra elegant (not to mention zero trip hazard) K & M round-base speaker stands. The £99 package price is a saving of about £20 on hiring each item individually making it exceptionally good value. 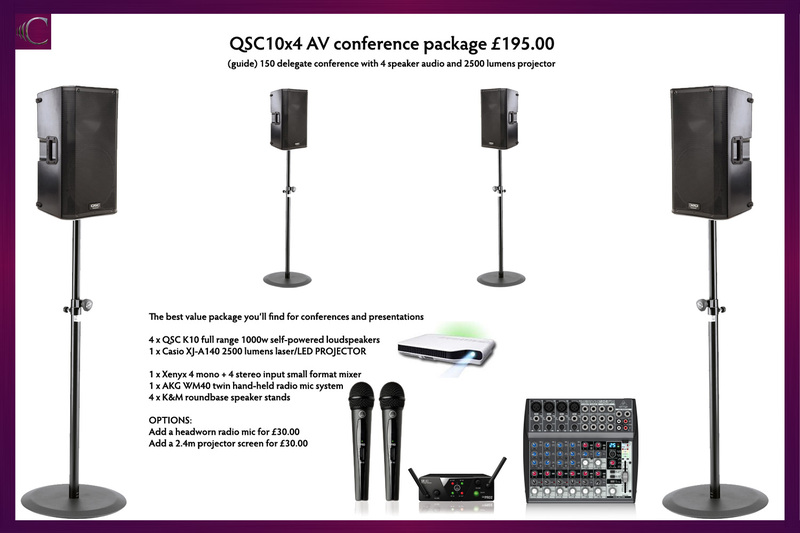 The result is that full audio visual packages start at just £99, with 4 speaker systems available at just £199. Audio only systems from just £69 and sophisticated systems with headworn radio mics and 2.4m projector screens also available. 2500 lumens projector added. Casio XJ-A140 slimline hybrid projector chosen as it's simple for non-technical operators to use with much less risk of damage meaning a stress-free hire. Oh and because it's an amazing projector easily creating 2-3m wide image from equal distance (approx. ).